Psalms 120 through 134 are called the Psalm, or Song, of Ascents. Four of the psalms are ascribed to David (Psalms 122, 124,131, and 133). One (Psalm 127) is credited to Solomon. It is believed that these psalms were sung by worshippers as they ascended the road to Jerusalem during the annual pilgrimage festivals. Sweet T and I had the profound experience of participating in a recreation of this worship tradition during our 2012 trip to Israel with a group from our church led by Todd Bolen. 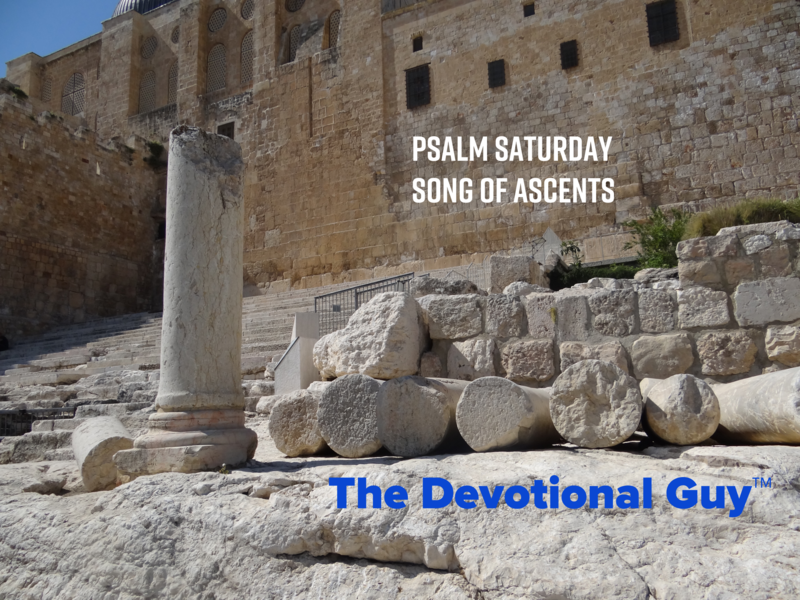 Our group recited these psalms aloud as we climbed the stone steps on the south side of the Temple Mount. Walking where millions of sandals had stepped before us in ancient times was a humbling and deeply inspirational moment of worship. Worshippers would enter the Temple from these southern steps, three times a year, after the prescribed cleansing in the adjacent ritual baths, or mikvot. Tradition and ritual serve an important purpose in our lives. Yes, we tend to rebel and revolt against such things in our modern 21st century society. Even our church culture tends to distance itself from the relics of ritual and tradition. Some of that, of course, is for good reason. However, not all custom and ceremony should be cast onto the woodpile waiting for the fire to consume it. Throughout history, diverse cultures, and numerous religions recognized the value and importance of reminders and repetition. Early Jewish cultures understood the necessity of rehearsing truth while living in a world that countered God’s Word at every turn. Today, we recognize the need to remind ourselves of God’s truth as Christians living in 21st century America during this tumultuous period in world history. Without reiterating it, God’s truth can be drowned out by the resounding dissonance resonating from the public square proclaiming faith, prayer, and worship are misguided at best, if not utterly impotent and useless. The thousands that made the pilgrimage and recited the Psalms of Ascent from memory several times a year were reminded of the keys of life such as faith, forgiveness, grace, mercy family, children, community; peace, hope, love; brotherhood and sacrifice. Practicing this thrice-yearly ritual helped them maintain right attitudes toward the Lord and toward others. Naturally, tradition and ritual can not save us. Scripture makes it clear only faith in Jesus can accomplish our salvation. But, as with our forefathers and our ancestors, repetition and observance of our cultural and religious practices help remind us of the difficulties and challenges we have overcome and serve as milestones guiding us along the path forward. They remind us of who’s we are. Jesus replied, “The most important commandment is this: ‘Listen, O Israel! The Lord our God is the one and only Lord. And you must love the Lord your God with all your heart, all your soul, all your mind, and all your strength. ’The second is equally important: ‘Love your neighbor as yourself.’ No other commandment is greater than these. Giving God priority and treating others as we ourselves would like to be treated empowers us to leave a lasting thumbprint on the world we inhabit and the people we encounter.